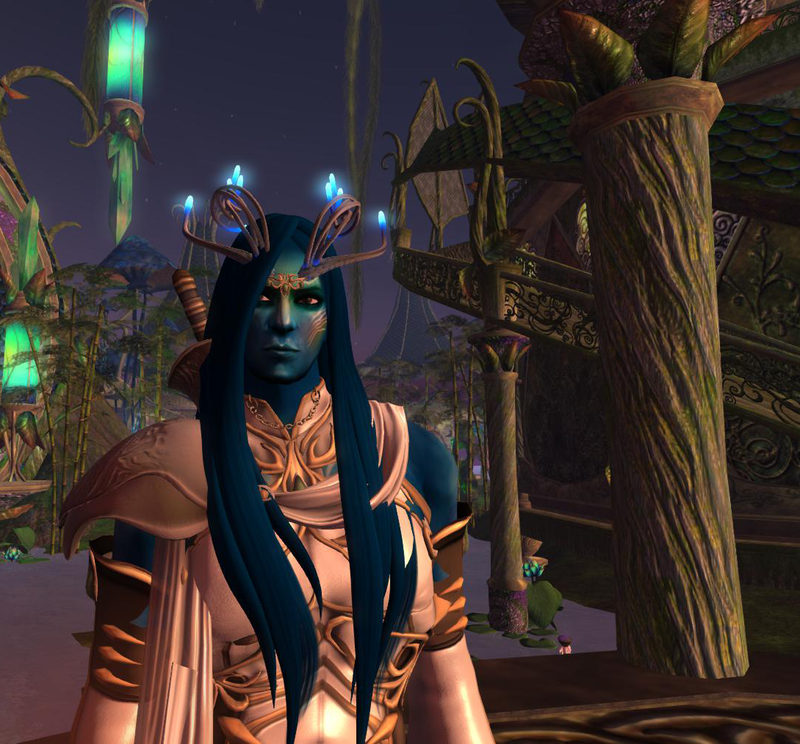 Elicio Ember, the creator of Cerridwen’s Cauldron and the sponsor and builder of The Faery Court, tells us what it’s like to build a Faireland year after year, what all the Fairelands he’s created have in common and what is the story behind The Faery Court. You can read more about Elicio, his involvement with the Faire and his reasons to relay from the interviews from 2013 and 2012. How do I do it each year? Barely…hehehe. Seriously though, the Fantasy Faire is not only a benefit event. Which I am all for. But its much more than that. It follows the kind of model where everyone wins; we do not only do a fabulous fund raising for Relay for Life, its also a great event for normal retails, and a great opportunity for landscapers like myself to showcase our skills. Its also a great showcase for new content, so everyone wins; we do great fundraising, landscapers get to do unique sims, merchants can display new content, visitors get to sightsee some of the most spectacular sims created during the year, and of course, there is great shopping! So everyone wins! Whats not to like about all that? That what keeps me returning year after year. 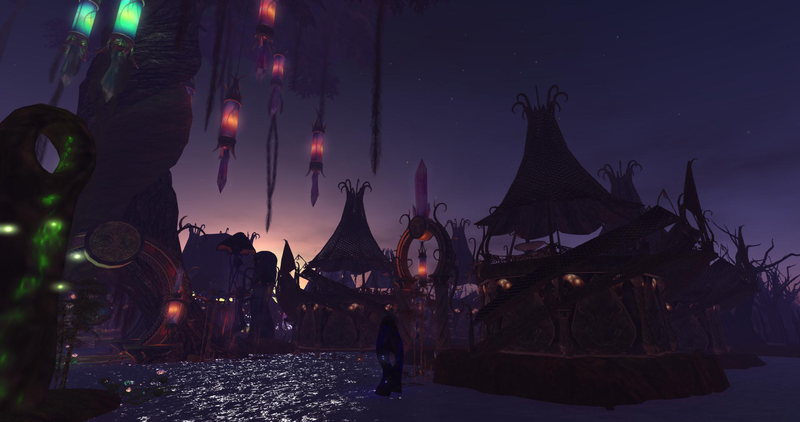 Lets See: 2011 it was Exotic Worlds (an alien jungle) and an emergency extra hand in the Sea of Mer (the mermen sim). 2012 it was two sims (which was utterly insane), the Ruins of Nu Orne (a souther asian ruins style sim in a exotic jungle vegetation) and the Siren’s Secret, a deep water sim with structures stilted on partially flooded walkways. 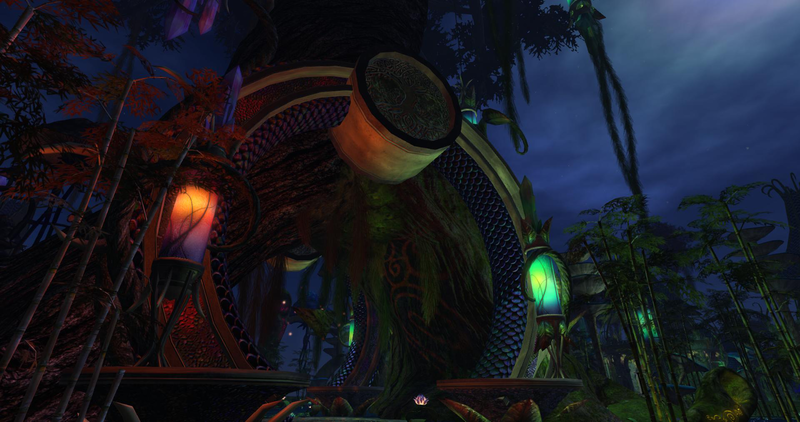 On 2013 it was The Titans Hollow, a canyon inspired sim with hanging structures shaped like Arabian stained glass lanterns. And this year, The Faery Court. Hm, now that I think about it there is indeed a common streak to them all: Structures created in harmony with nature. But this has not been a conscious effort, its just a reflection of my deep love and admiration of nature. And my belief that humankind will eventually learn to live with nature instead of “from” nature. In harmony with it instead of destroying it where we live. This year I am landscaping and sponsoring the Faery Court, based on the traditional idea that divides the Faeries in two courts (though some myths divide it in four, one for each season). The two courts are the Seelie, who represent day, growth, spring and summer, and life, and the Unseelie, who represent night, decay, autumn and winter, and death. In the center of the sim you can see a gargantuan tree (one of the largest trees SL has seen so far I think) composed of two intertwining trunks, one mossy and lush, the other dry and fiery leafed. 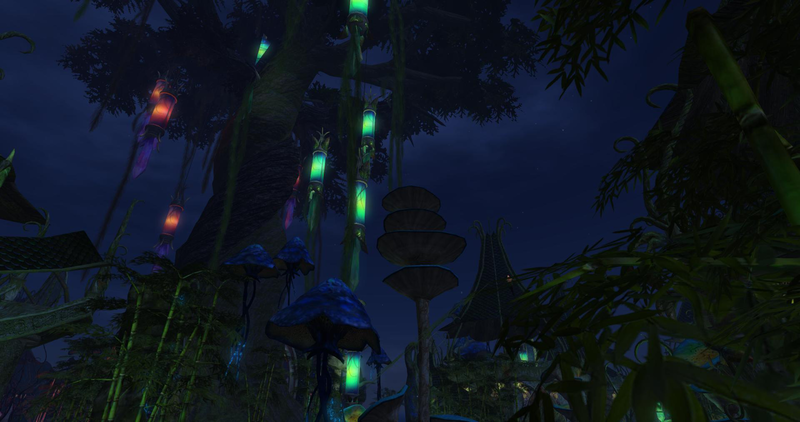 The seelie side is full of mossy and fresh greens, bright hues, and a feeling of freshness. The Unseelie side is all dry and musty, thorny and slightly eerie. Its not about good and evil, its about balance, though of course, the Unseelie fae tend to be somber and less…attractive, to mortal perceptions, hehehe. Do you think the tiny sheriffs will apprehend you for your scandalous waffle-noming plants again? Not if I can hide my heinous deeds from them or if I can outrun them!! To be honest to see what people think of the sim. I have tried lots of new things this year. Most of the sim is mesh, the structures are completely mesh. I also did a lot of complex texture work this year, using the new “materials” options to great effect I think: cool bump-maping, several types of metallic textures, iridescent floors, mosaics and roof tiles, emissive textures…. Also, the giant tree has pretty accurate physics, so you can walk around the giant branches or climb the base. I love the atmosphere the combination of texture work, mesh, color schemes, light and sound gives to the two halves of the sim, and I am looking forward to see visitor’s impression on it. How was The Faery Court born? What inspired it, what is its story? Even though I personally start to work on the sim design around 2 months before the Faire, I start thinking many months before that. Usually around December or January. Sometimes earlier. Its a very intuitive process for me on what to decide to do each year. A couple of years I was given a very general guideline, a mer sim, or a jungle sim. But the last two years it has been totally up to the designer. In the case of the Faery Court, I had seen a couple of movies that had inspired me, and played a couple of games that gave me great ideas. Also, I had been wanting to do some whimsical buildings inspired in surrealist architect Gaudi. I wanted to try my hand at doing all the mesh and texturing tricks I had learned. And the Faery Court was perfect for all of that. The story of the Court itself is that of a place where High Fae reside…the royalty of Fae so to speak, the Sidhe. These are either Seelie or Unseelie, and though with contrasting tastes and objectives, they are not enemies (though they do not have to like each other either). They both are conscious of the essential role their kind represents, and their interdependency with the other court. This is symbolized by the Tree, which represents both growth and decay, spring and autumn, in its trunks that intertwine and swirl around each other. The stories that are told here, I leave to the fae folk that visit. Thank you, Elicio, for taking the time to chat with us and for building us new Fairelands every year!